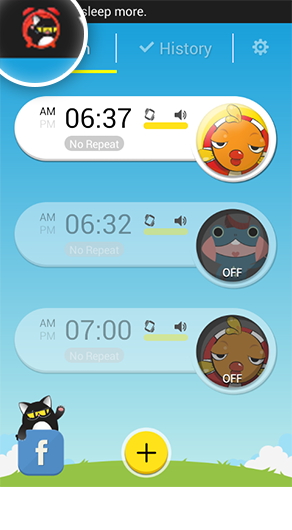 Today, let’s take a look at the alarm ‘Snooze Time’ feature. 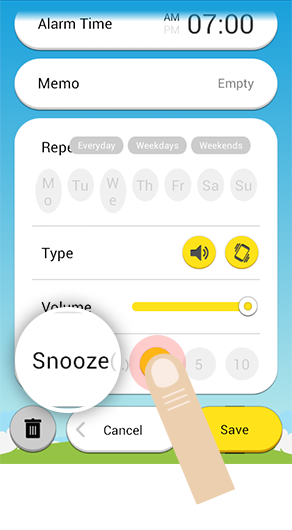 Many users have asked us what the ‘Snooze Time’ feature is. 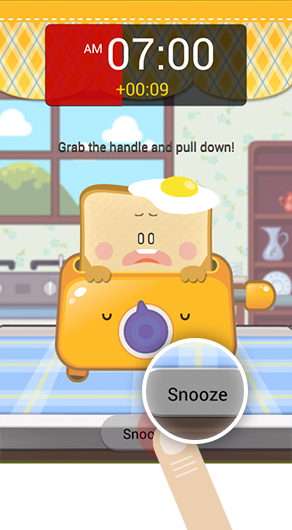 Alarm ‘Snooze Time’ allows you to repeat the alarm (it is not turning off) at a fixed time interval. So, when you need extra sleep, you can simply press any one of the choices on the alarm control panel: 1, 5 or 10 minutes as seen below. So press ‘1’, ‘5’, or ‘10’ to repeat your alarm to ring. When the alarm goes off at the alarm set time, you can simply press “Snooze” button as seen above. For example, if you set ‘Alarm Time” at 7 a.m. and ‘Snooze Time” at 5 minutes on the control panel, the alarm will go off at 7 a.m. first. If you don’t turn off the alarm but press ‘Snooze’ button twice on the screen, then the alarm will go off automatically at 7:05 a.m. If you turn off the alarm at 7:05 a.m., then the alarm will not ring anymore. However, if you still need extra 5 minutes of sleep, you can again press ‘Snooze’ button twice and the alarm will ring again at 7:10 a.m. and so on and so on. Remember, you need to press ‘Snooze’ button twice to repeat the alarm at a fixed time interval. By the way, if you have activated this ‘Snooze feature, the red icon will pop up on the left top corner of your screen (please refer to the picture above) for a couple of seconds, saying ‘you can sleep more’. For those morning sleepers, you can always use ‘Snooze Time’ to help you get extra 5 or 10 minutes sleep. But, remember not to repeat the ‘Snooze’ too often as you don’t want to be late to school or work!